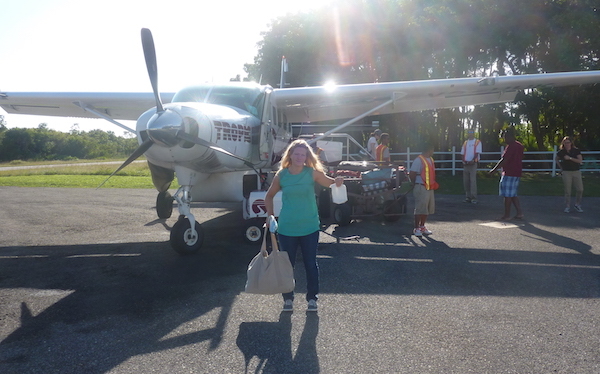 So Placencia is cool, I mean really cool, and it’s pretty damn easy to get to if you want to shell out the cash for a Tropic Air flight from Belize City to the little air strip just north of town… which is exactly what we did. 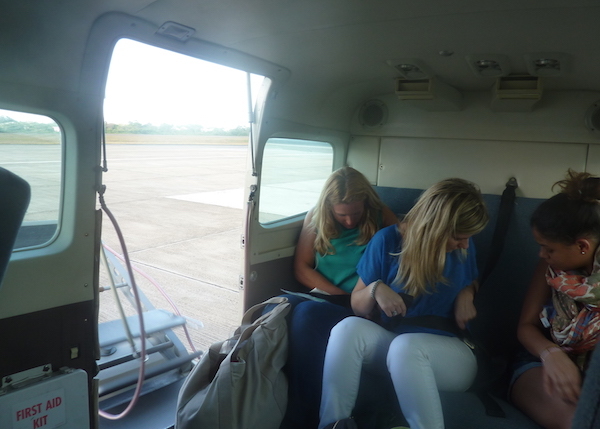 It was about a 20 minute flight on a little 14 passenger Cessna- the type where they distribute the passengers in the seats based on their eye-ball assessment of your weight. FUN! 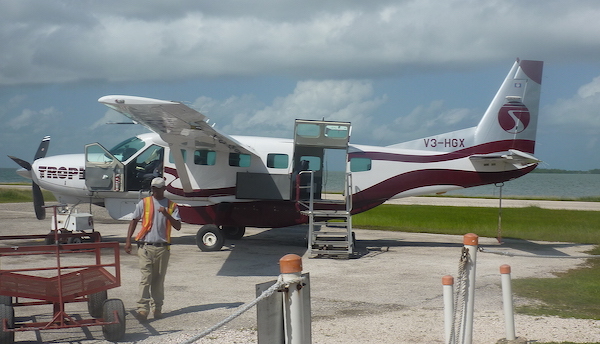 The flight from Belize City to Placencia cost us about a hundred bucks each but you can get to Placencia a lot cheaper if you aren’t in a particular hurry. You could take the twice daily bus- definitely the cheapest way to do it- if you don’t have much luggage, but this is an all day journey on a very crowded old school bus that makes frequent stops. There is also an airport shuttle that goes back and forth up to 3 times a day for $55 per person; this option is a lot more comfortable than the bus and a lot quicker too, probably 3 ½ hours as opposed to 5 on the bus. But regardless of how you get there; once you arrive you’re going to want a drink right? You’re on vacation after all. Well, luckily for you there is no shortage of options for you to choose from. Just take a stroll up the beach or “the sidewalk” which is the main drag running through town- foot traffic only, pretty perfect. Our first stop was the Pickled Parrot. We had read about this place in another ex-pat’s blog http://yourescapeblueprint.com/the-trucker-teacher-and-three-legged-dog-adopt-a-pickled-parrot/ and wanted to check them out because they’re from South Jersey too! We met their son and dogs and had our first Belikin at the Pickled Parrot. This is a super friendly hang-out that serves up reasonably priced drinks and American food. They had philly cheesesteaks for a lunch special one day though we didn’t stop in to sample it. 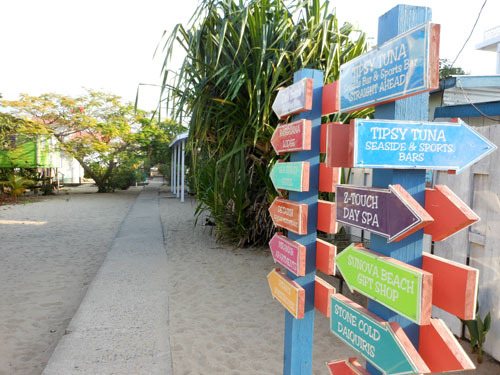 If you really want to let loose and experiment with rum punch, frozen concoctions and mixed drinks galore you’re going to want to hit up Barefoot Bar. 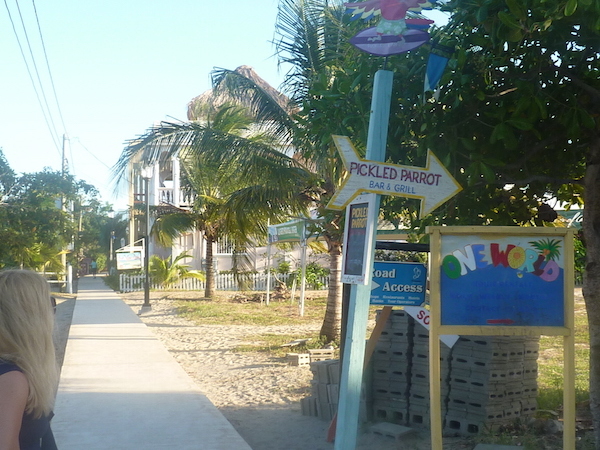 This is probably the most popular place in Placencia, followed by the Tipsy Tuna that is located right next door. Both are centrally located and situated on the beach. The Tipsy Tuna has a bigger stage and massive dance floor but the Barefoot Bar has an outrageously epic menu. You can get all kinds of great snacks at Barefoot like breadfruit chips, fried plantains, loaded nachos, Mexican pizzas, conch ceviche, and wings. For more filling fare you could expect dinner specials like citrus buttered lobster (in season), habanero mango shrimp with coconut rice, or maybe a barracuda steak. 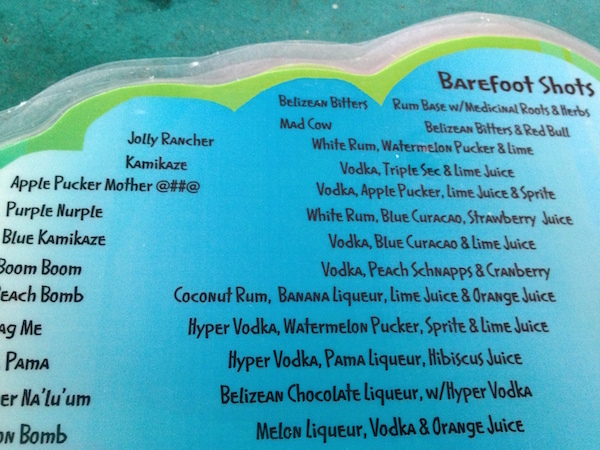 Though the food is good, the real draw to Barefoot Bar is the drink menu- pages upon pages of it. So many choices! 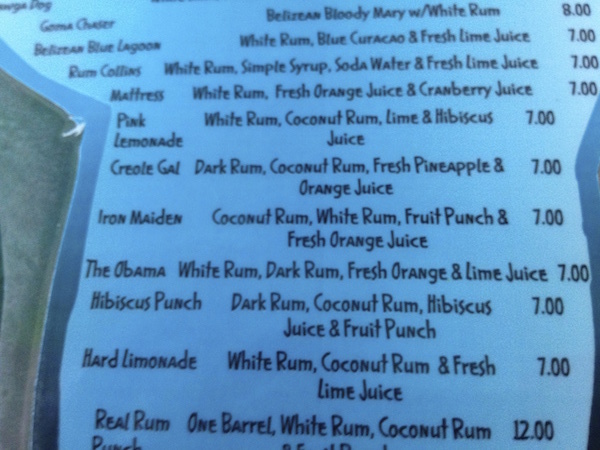 We tried our damnedest to make a dent in the drink list but I’d guess you’d need a good 10 weeks of consistent patronage to sip your way through everything they pour out at Barefoot. Challenge accepted! 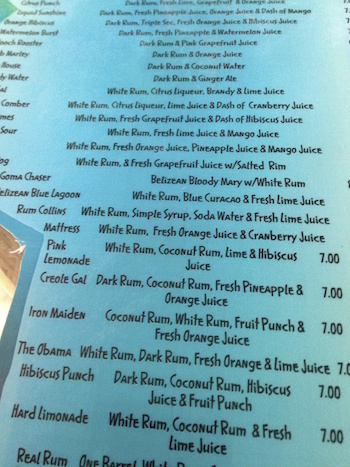 If we move to Placencia I’ll make it my mission to try them all. What I love about the bar culture here is that it’s so casual and friendly. Casual might not be the right word to accurately describe it. The come-as-you-are mentality is in place and that means if you’re in a damp bathing suit or a bit briny from just finishing a fishing trip- it’s okay. No shirt, no shoes, no problem. All are welcome, even the stray dogs. 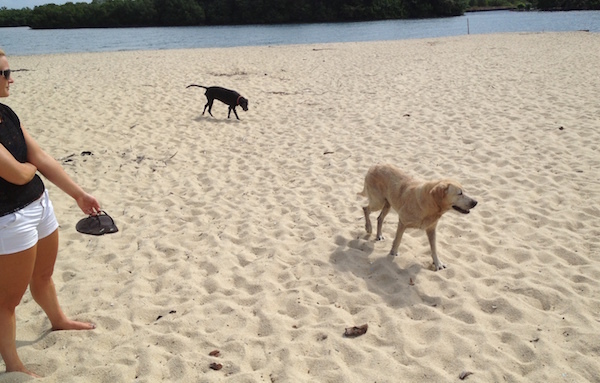 Our beach buddies! They followed us around most of the week- around town and in to the bars!!!! During our trip we saw workers feverishly trying to complete the new- and the town’s first and only- nightclub. The owner/ operators of Barefoot Bar were building Street Feet Nightclub so when the live music had to wrap up at the beach bar their revelers could roll down the sidewalk and move the party indoors as to minimize the noise in the neighborhood late at night. It opened the weekend after we went home- darn! If ever I was going to find an appropriate time to wear the platform sandals I’d packed (and left in the suitcase the entire trip) it would have been to Street Feet. 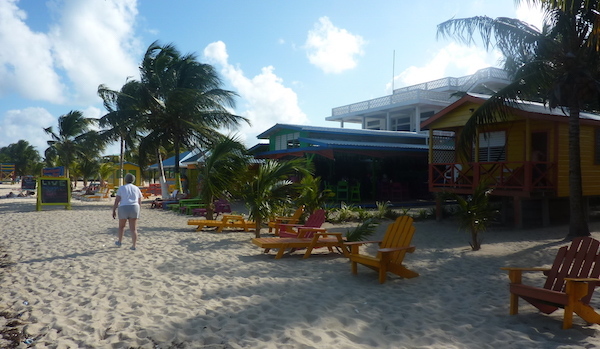 The friendliness that permeates the bar culture in Belize is also notable. Obviously American bars are friendly; we go to them to listen to some tunes, enjoy some libations and meet up with friends. In Belize they do the same but it’s more of a community experience; socializing is almost a sport- they’re not just going to meet up with their friends, they’re going to make friends. Back home I’d never feel comfortable just striking up conversation with a bunch of strangers in a bar; and if someone did this to me I’d be suspicious of what their angle was- are they hitting on me? Maybe they’re some sort of weirdo or con artist. In Belize people come across as genuine and authentically gregarious. Both the tourists, the ex-pats, and the locals are legitimately curious about you; about your experience in Belize, where you’re from and where you’re going. They’re happy to offer advice or answer questions and they all have a funny story to share about this little country that has so much to offer. 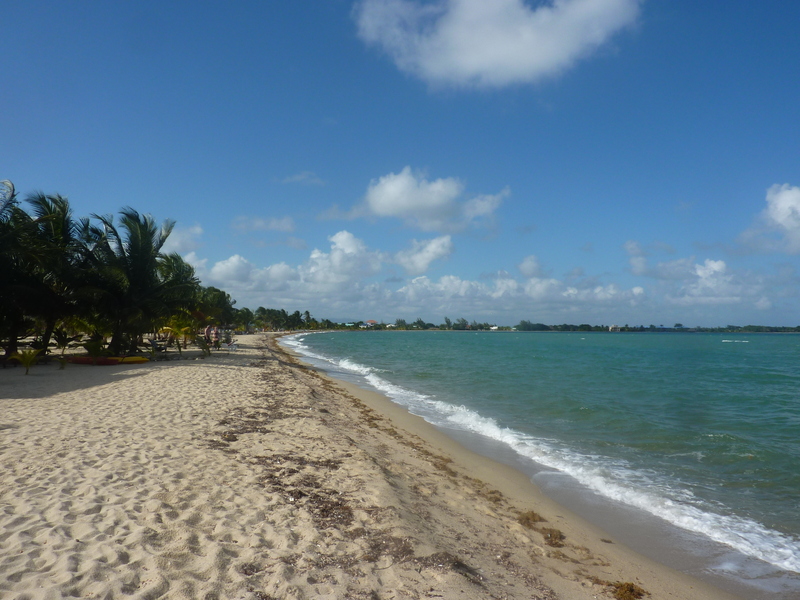 It might have been the time of year we visited (early February) but it seemed to us at least that Placencia’s population was almost evenly split between ex-pats and Belizeans. There were a ton of Canadians- whether the majority of them are just snowbirds or they stay there year-round I don’t know but we kept seeing Canadian flags flying on homes around town and license plates from Quebec and Vancouver – imagine that drive, yikes!